Many people think the age of the Travel Agent is long over. The industry definitely saw a drop in need as internet services grew. But things are changing once again! You can easily jump online and find a cheap hotel or convenient airfare for your next trip. But there are a few things you might miss when booking on your own. 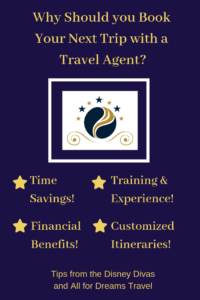 Continue reading for a list of benefits, and a few of my favorite tips, you receive when booking your trip through All for Dreams Travel. Why should you use a Travel Agent for your Disney World trip? Credible agents take the time to learn about the products they sell. In fact, suppliers such as the Disney Travel Company and Universal Orlando recommend and/or require you complete their training prior to booking products directly. Annual retraining, on site visits, personal travel and agency bookings round off agent experience. How do you benefit from this training and experience? You will receive a personalized trip, tailored to your needs, requests and budget. A good agent will spend some time asking you questions about past travel, current expectations and personal needs. Your answers will initially help with product recommendations. More importantly, they will help your agent offer customized tips that apply to your trip. If possible, travel Monday to Monday or Tuesday to Tuesday! Flights are typically lowest on these days and park crowds are lower. Additionally, your resort rate may be lower since you only have two days of weekend rates. On the Ferryboat to Magic Kingdom. Thank you Sleepy Diva for use of the photo. You can save considerable amounts of time when using a Travel Agent for your vacation. Thanks to our training and booking experiences, we are quickly able to weed out resorts and packages that will not work for your group’s travel needs. You save hours of time not researching specific resorts, package definitions and price offerings. We qualify your needs in advance and quickly offer suggestions for which resorts and packages fit with your budget or lifestyle. All for Dreams Travel quotes include resort and room amenities, any perceived disadvantages of the resort, photos and comparison pricing. You also save time when your Travel Agent takes on the planning aspect of your trip! We track important dates associated with your trip so that you don’t have to! This includes watching for Advance Dining Dates, Fast Pass Scheduling, Magic Band Customizing and Final Payment dates. After gathering your requests, we are happy to take on the actual scheduling for you! That means you do not need to be up at 6:00 AM on your ADR day or 7:00 am on your Fast Pass day. We happily do it for you! Finally, an experienced agent will help you navigate the parks or your chosen destinations to help maximize your time. Most guests do not want to waste time or energy running all over the park. All of these agent services can save you hours of research, planning and scheduling. You get to work with an experienced agent, voice your requests than sit back while we do the work! All you have to do is pack, make your payments and anticipate your trip. If booking a Fast Pass for both Rock & Roller Coaster Starring Aerosmith and Twilight Zone Tower of Terror, try to book them early in the morning. We like to try for R&RC from 9:15-10:15 and ToT 10:15-11:15. With this schedule you can enter Hollywood Studios at park opening and make a quick run to a stand attraction (Voyage of the Little Mermaid, Disney Jr! Live on Stage or Jedi Training scheduling). You can then casually make your way to Sunset Blvd to enjoy R&RC around 10:00. From there head directly to your ToT Fast Pass, right around 10:15. As soon as you exit, make a quick restroom stop and head to the stand by line for Beauty & the Beast Live on Stage. You have now completed all of Sunset Blvd and can spend the rest of your day in the more central area of the park. No time wasted jumping around the park. If you don’t mind chilly evenings or pulling kids out of school, late January and early February are great times to visit the parks! Crowds are typically lower and your schedule isn’t impacted by Spring Break visitors, summer heat or Halloween/Christmas parties. 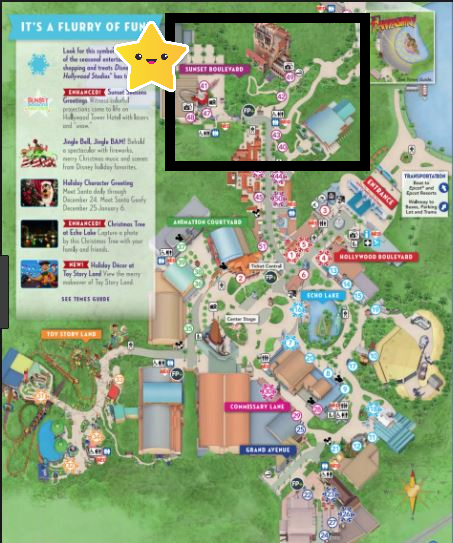 Try to plan Fast Passes so you complete one area of the park before moving on! As mentioned above, seasoned agents will be able to quickly match your budget and needs to create a spectacular trip for your family. We would prefer to give you an ideal vacation within your budget, hoping the experience will keep you returning for future trips. We see value in future commission and referrals. We believe that pricing you out of your budget will only lead to frustration and distrust in our services. Another savings comes from discounts that may be announced and apply to your booked or future trips. Many agents monitor for discounts and apply them to your trip while you are still sleeping! 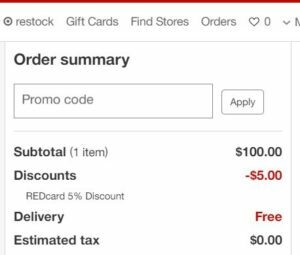 Imaging waking to a message that a new discount has become available-allowing you to upgrade to your dream resort or saving you a few hundred dollars on your existing trip. Nothing like making money in your sleep! As mentioned above, be open to traveling during the Value Season-you save time, money and stress! Stick to your budget and save some extra cash by purchasing Disney Travel Gift Cards. You can enjoy fuel savings when purchasing from a participating grocery/fuel store. 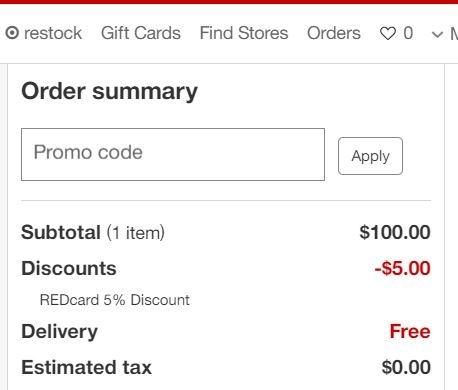 Alternatively you can save 5% when purchasing from Target with a Red Card. While on site consider splitting meals where you can and/or ordering groceries from Amazon Prime Now, Garden Grocer or other grocery delivery sites. Use loyalty programs to save for your next vacation! As mentioned above, agent experience helps save you time and money in the planning stages. But it also allows them to make tips specific to your vacation. Their training and on-site experience is passed on to you through trip plans and suggested itineraries. All for Dreams specifically sends door-to-door instructions that pertain to your vacation. We also include a suggested itinerary based on your reservation details, park hours, historic crowd levels and attraction wait times. More importantly, these tips are based on your group’s requests! Pay attention to parade schedules when navigating the park. Say you are enjoying Magic Kingdom’s Tomorrowland but have a 3:10 reservation at Crystal Palace. If the Festival of Fantasy Parade is scheduled for 3:00 you need to be across Main Street before the parade route is closed. Otherwise, you will be forced to walk the perimeter of the park, avoiding the parade route and losing valuable time. You may even miss your dining reservation. Make your allergies and medical needs known and contact Disney World’s Special Diet Service Team if necessary. 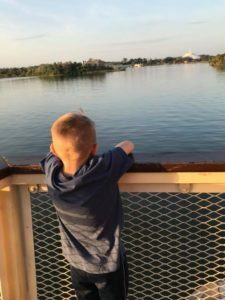 It is well-known that Disney World Parks and Resorts can be very accommodating to those with allergy and medical needs. 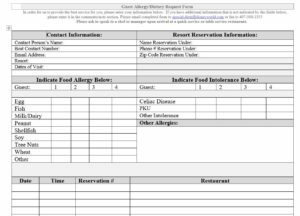 They offer common allergy menus and the opportunity to speak with a Chef to discuss your special needs. Often, the chef’s are able to quickly whip up a meal that meets your food standards. However, if you have a true medical need you can also work with the Disney Special Diet Team in advance of your trip, making sure your food requirements are met. After contacting the Special Diet Team you will receive a Special Diet Request Form. 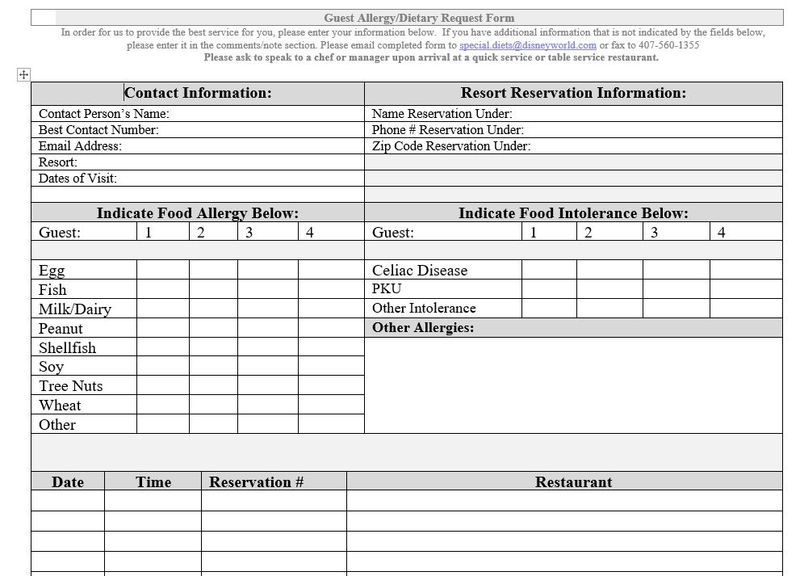 Complete this form, including your medical concerns/allergies, dining reservation times and confirmation numbers and return it to the team. The information will be forwarded directly to your restaurants. You may receive a phone call in advance of your visit to arrange special meals, if necessary. Contact Disney World’s Special Diet Team for help with your allergies and medical needs. Many travel agents offer promotional gift cards, on board credit or gifts to entice you to use their services. All for Dreams Travel tries to include a gift as a thank you rather than an incentive to book. We believe our experience and service is the reason you booked with us. Your final packet, which will arrive about a week prior to travel, will include a travel gift for your children. If you are enjoying an adult only trip, gifts may be included or magically appear at your destination! Please note that most agents offering gifts are doing so out of their own pockets. We do not typically receive credits from the supplier that get passed along. As with any other service provider, they are being paid to do a job. Disney and other suppliers do not pay them to provide clients with gifts. Please do not expect gifts or On Board Credits from any agency. We appreciate you using our service! The final benefit of using a Travel Agent for your vacation-you already pay for the service!! The rate you pay for your trip is typically the same price you pay if you book on your own, Agent rates and supplier rates should match. You package should not cost any more with a Travel Agent-again, our commission is built directly into your costs. You pay the service fee even if you don’t use an agent’s services. Exception: Some agents add service fees to their services. Be sure to clarify any additional fees up front. When you book your trip with a Travel Agent, twe receive our commission directly from the supplier. You pay nothing extra, receive stellar service and the Agent receives a paycheck. If you book on your own you are responsible for all the planning and monitoring but are still paying that commission to the supplier. Disney, Universal and all other involved suppliers keep the money for their profits. Why not receive the service you are already paying for and take the stress and time constraints out of your trip? As you can see, there are many benefits to booking your trip with a well-trained, experienced vacation planner. 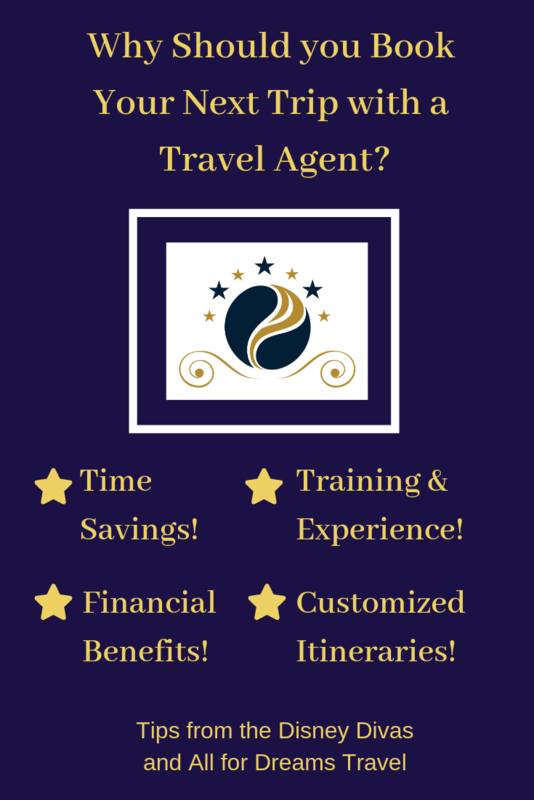 If you are interested in saving time and money consider booking your next trip with a Travel Agent. If you are interested in gaining expertise, tips, suggestions (and small gifts! 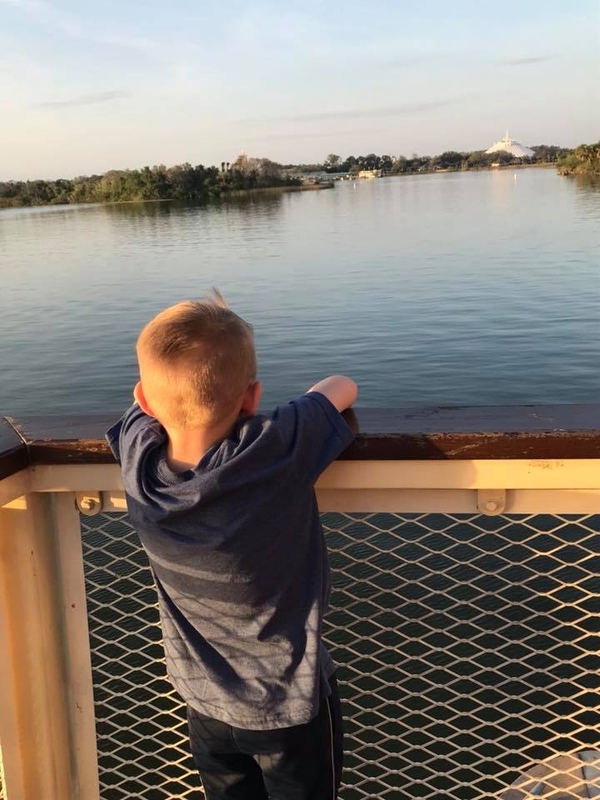 ), then consider booking your trip with All for Dreams Travel, an independent agency with Gateway to Magic Travel-an Authorized Disney Travel Planner. All for Dreams Travel is an independent agency with Gateway Travel/Gateway to Magic Travel, an Authorized Disney Travel Planner.